The Workgroup Bridge feature of your Linksys Wireless Access Point allows you to extend the accessibility of a remote network. In the Workgroup Bridge Mode, the access point (AP) acts as a wireless station (STA) on the wireless LAN. It can bridge traffic between a remote wired network and a wireless LAN. When Workgroup Bridge is enabled, SSID configuration still works to provide wireless services to clients. Workgroup Bridge only supports IPv4 traffic. Remote AP doesn’t need to use the same SSID. The remote AP can be a common AP or wireless router. Workgroup Bridge Mode only works with one (1) radio at a time. 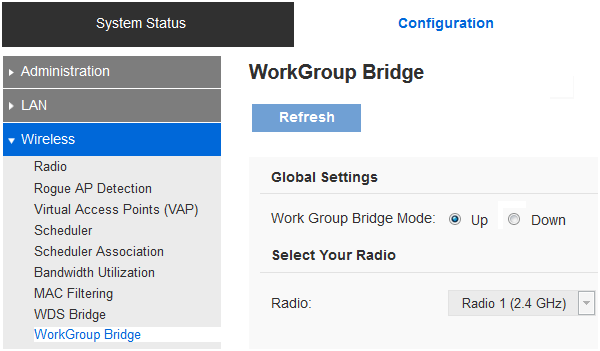 When Workgroup Bridge is enabled, WDS will be disabled automatically on the same radio if it’s enabled. In this scenario, the main AP has been configured and working in the network that supports a Workgroup Bridge and you want to add a second AP in Workgroup Bridge Mode. Access your AP’s web-based setup page. For instructions, click here. Select Configuration tab, click Wireless > Workgroup Bridge. 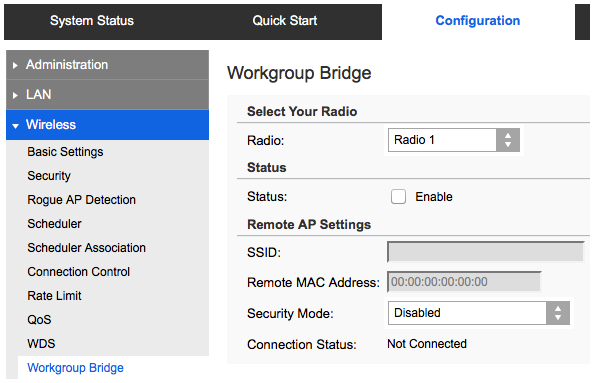 Select the Radio of the main AP that you wish to use to create the Workgroup Bridge. On the Status section, check Enable. Click the Site Survey button and select the wireless network name (SSID) of your main AP. Select the Security Mode and enter the Pre-shared Key of your main AP. IMPORTANT: If your AP is using its default IP Address 192.168.1.252, it temporarily cannot access the web-based setup page once you click Save. Once both APs have been configured successfully as a Workgroup Bridge, the remote AP will now automatically obtain a new IP Address from your DHCP server. To be able to access its web-based setup page, you need to check your router’s DHCP Client Table to know its new IP Address. QUICK TIP: You can check the status of your Workgroup Bridge on the Connection Status section. Select the Configuration tab > Wireless > WorkGroup Bridge. On the Work Group Bridge Mode section, select Up. 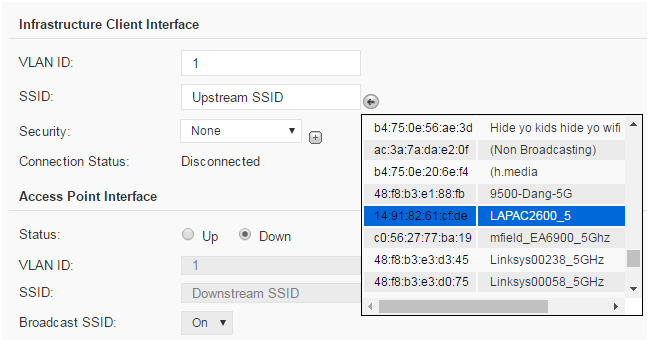 Under the Infrastructure Client Interface section, click the arrow icon to select the wireless network name (SSID) of your main AP. Select the Security type and enter the Key of your main AP. NOTE: It may take a few seconds for the connection to be established, click the Refresh button. QUICK TIP: You can check the status of your Workgroup Bridge on the Connection Status section. The status bar will show up as Associated or Connected once you have successfully configured it.